You are assured that the tool you purchase is a brand new or a certified reconditioned top quality tool, fully backed by the manufacturer. Some manufacturers will only honor the warranty for a tool purchased from an Authorized Retailer. Tools purchased from Authorized Internet Retailers in the U.S. are intended for the U.S. market. Items purchased from non-certified retailers may not be UL listed and could be unsafe. They may also lack accessories provided with U.S. market products or be difficult to find parts for should they need repair. Information from an Authorized Retailer is the latest information provided by the manufacturer. Training and support are given to Authorized Retailers to ensure the best and most knowledgeable service is available for customers. Being an Authorized Internet Retailer Tools-Plus.com makes sure that your purchase goes smoothly and that you get the highest quality service available. What is an Authorized Internet Retailer? A large selection of tools from that manufacturer. 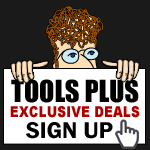 Tools-Plus.com has a selection of over 5000 tools from the top tool manufacturers. Having the majority of orderable items in stock, unless they drop ship from the manufacturer. With both our store and warehouse space Tools-Plus is able to keep a massive stock of merchandise. The majority of the orders placed with us can be filled and packed up well before the carrier shows up to take them out at the end of the day. A minimal amount of website outages throughout the year. We partner with Yahoo and are therefore able to keep our site running 100% of the time with no down time or server issues. You will always be able to place your order with us. By partnering with Yahoo!, we are able to offer you the highest levels of transaction security available. Yahoo! is one of the oldest and most trusted names on the web and their servers offer levels of security that you may not find on many sites. Up-to-date, high resolution images of the manufacture's products. The web developers at Tools-Plus work hard to make sure that the images and media are the highest quality available and also up-to-date. If you see something that could use improvement, feel free to bring it to our attention. Features that cater to the needs of the target group for the manufacturer's tools. Our web team is very active, not only on our site, but also in the general online woodworking community; making sure that people are aware of the high quality and low prices that they can get by shopping with Tools-Plus.com. For each tool we carry links to appropriate accessories with pictures and descriptions of those accessories. Click on any of our items and you will notice an associated item section towards the bottom of the page. This ensures that you get the most out of your tool by showing you accessories and associated items that add functionality to the already top quality products we carry. Fast page load times to enable ease of use. We check the average page load time for our site to make sure that our pages will load smoothly on an average internet connection. A clean and nice looking site which will reflect positively on the manufacturers which we carry. Tools-Plus.com incorporates the best practices and standards to make sure that our site will display properly on all browsers. Contact information for our site prominently displayed. You can find our contact information at the top of each and every page on our site, or here How to reach us. Orders for items in stock are processed in a timely manner. All orders for in stock items placed with Tools-Plus ship out within 24 hours of customer information verification.